Large size – More than half of the total number of app uninstallations occur due to the concerned application taking up too much of storage space. That’s precisely the reason why mobile app companies generally shy away from making apps that are too ‘large’ in size. The average sizes of an iOS app and an Android app are 6 MB and 23 MB respectively (the average sizes of games made for the two platforms are 40 MB and 60 MB). A user might find an app interesting, thereby triggering download behaviour. However, as soon as (s)he finds out that it is hogging a lot of memory space, (s)he is likely to get rid of it and find a ‘smaller’ alternative. Poor loading speed and complicated UI – Any app developer worth his salt would know that if an app is not user-friendly, it’s fate is more or less sealed from the very outset. A painfully slow loading process (with the splash screen being displayed for a minute), complicated in-app navigation, and absence of clear instructions for users can all lead to people getting frustrated with a mobile application and deleting it. A very simple app that is quick to load and easy to use can be a fairly big success (how about the ‘Dots’ game? ), while a large app that crashes frequently (and hence, has to be restarted every time) is destined to fail. Note: Most app users prefer apps that launch within 2-3 seconds after they have tapped the app icon. 3. Unfulfilled promises – How do you decide whether you should download an app or not? That’s right – by checking out its title, and more importantly, its description in the App Store/Play Store. Now, in their overenthusiastic bids for app store optimization (ASO), some developers make the folly of making false claims about the functions of their apps. This strategy might lead to a short-lived initial spurt in downloads, but users would soon find out whether an app actually delivers what is promised in its listing page at the store. 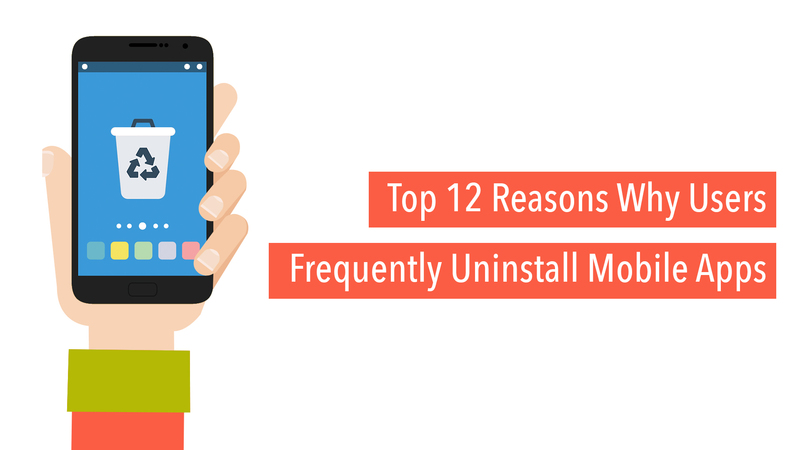 If it doesn’t, uninstallation will be prompt, reviews will be poor, and app retention rates will remain shabby. 4. Ads that hamper user-experience – The majority of both iOS and Android apps are free. Obviously, developers wish to make money from them – and hence, they implement a mobile app monetization plan in their software. In-app ads are the go-to option for many developers, and problems can crop up if these ads are: a) too frequent, and/or b) are intrusive in nature. Forcing users to watch video ads (without a ‘Skip Video’ option) is another classic cue for people uninstalling the guilty apps. Ads have to be designed and deployed in a manner that does not interfere with how individuals are likely to (and would like to) interact with applications. Apps with too many ads invariably create a negative impression. 5. Mandatory social login – A long-drawn, complicated signup/registration process is an absolute no-no in a mobile app. That’s precisely why Android and iOS app developers provide a social login option (‘Login via Facebook’) in their applications. Apart from being quicker, this has another advantage too – since social logins help developers access more personal information about users. However, this strategy backfires when social logins are made compulsory. There is a large section of smartphone-users who would prefer not to link their social media accounts with the apps they use. If an app gives such users no other option, they will, obviously, uninstall it. 6. Absence of an offline mode – Online social networking apps, mobile news portals and real-time multiplayer games are all very nice – but an app should have a properly functioning offline mode as well. A large percentage of users interact with apps on their devices at places where network coverage is either weak or totally unavailable (during a trip via underground rail, for example). In case there is no offline mode, that severely hampers the usability of an application – and can prompt users to delete it. 7. Battery-consuming monsters – A significant percentage of frequently uninstalled apps have a common problem – they cause excessive battery drain. Those who make apps cannot really assume that people will actually ‘kill’ their apps after using them every time (most users indeed keep apps running in the background). Certain games have been reported to have caused around 40% battery drain, simply because they were kept running on devices overnight. Device overheating is yet another problem – frequently experienced by users fond of gaming apps. Having to recharge a smartphone after every few hours is not something anyone likes, and for users, it is a smarter option to identify and get rid of the rogue app. 8. Inadequate privacy – Mobile app security is something that all contemporary leading app development agencies around the world take very seriously. Research results have shown that 3 out of every 9 apps pose a threat to user-privacy, and hence are not likely to be retained on devices for long. Online shopping applications, m-payment portals and social networking apps are particularly vulnerable to such threats. In simple mobile storytelling apps for kids too, parents generally wish to make sure that there are no risks of accidental in-app purchases. If security is an issue, the popularity of an app can never soar. 9. Notifications and more notifications – Sending notifications from time to time is a great way for app developers to remain in touch with users. Some apps tend to overdo this though, sending notifications. emails and other messages too frequently – stuff that most users are not interested in at all. What’s more, many of these apps do not provide users an option to ‘Turn off notifications’. Hardly anyone likes their phones to constantly buzz with useless notifications – and after a certain level, they can lead to apps getting ousted from devices. 10. Non-availability in local language – Before downloading an Android or iPhone application, users often do not check the languages it is available in (if the app description captures their attention, they directly proceed to download). Most individuals simply assume that the app they have downloaded will be available in their local language. Localization, however, is something that indie app developers (companies are more careful about it) tend to neglect. Among the countries that account for the maximum app downloads and revenues, more than half are non-English speaking. The onus is on developers to customize the UI of their apps with the native languages of the different countries. Why would anyone retain an app that has text in a foreign language? 11. Finding a better app – Oh well, not much can be done about it. A developer can keep claiming that (s)he makes the best mobile apps – but users can think otherwise, and in the end, it is the perception of the users that count. People can download and install an application, start using it, be reasonably satisfied – until they come across a similar app that has seemingly better features. In such cases, very few users would keep both the apps on their smart devices. The first one (which is now viewed as ‘not that good’) ends up getting deleted. Note: Nearly 29% of all instances of business app uninstallations occur when users find a better app. Risks of data loss is yet another major reason for prompt removal of apps of this type. 12. Deceptive buttons and tap targets – Certain problems can linger in app screens that have apparently neat and organized UI. Mobile app designers might mistakenly (or in a bid to enhance user-interaction), include elements that look like buttons, but do not generate any ‘call-to-action’ behaviour when tapped on. Another common mistake is making the actually tappable links and buttons and tabs too small – causing users to face problems while trying to correctly click in the ‘active area’. Things like these irritate users – and from there, uninstalling the app is the natural next step. Glitches in the screen rotation features of apps is also a common cause for app deletions (particularly in case of games). Android and iPhone app development experts advise making custom versions of applications for different devices (phone, tablet, phablet, etc.). Misleading text on the app screens and absence of standard navigation bars lead to uninstallations as well. According to a 2015 survey, 68% respondents stated that long, complicated registration process led them to get rid of newly downloaded apps from their devices. The user-engagement level of a mobile application gradually falls over time. On average, 55% users regularly interact with an app after a month of downloading it. The percentage goes down to 35% after three months. The point is, however, that many apps do not even last a week on handsets, due to any (of a combination) of the above reasons.